Avis' offer of $46.50 a share for Dollar Thrifty is above Hertz' offer, which is currently worth $39.86 a share, but below Dollar's closing price of $48.68 Wednesday on the New York Stock Exchange. (Reuters) -- Avis Budget Group Inc. offered about $1.33 billion to buy Dollar Thrifty Automotive Group Inc., topping rival Hertz Global Holdings' offer, but still short of the company's current market value. Avis offered $39.25 in cash and 0.6543 in stock for every share of Dollar. Dollar Thrifty shares fell about 2 percent to $47.85 in after market trading on Wednesday. "We are prepared to enter into a merger agreement that contains substantially the same terms as the Hertz merger agreement, but which includes removing the matching rights, eliminating the break-up fees, and increasing the commitment to secure antitrust approvals," Avis said in a letter to Dollar Thrifty management. In May, Avis said it was interested in making a "substantially higher bid" for Dollar Thrifty after Hertz offered to buy Dollar shares at a mere 5.5 percent premium. Hertz and Avis have already begun the process of getting antitrust approval and have both received "second requests" from the regulator. 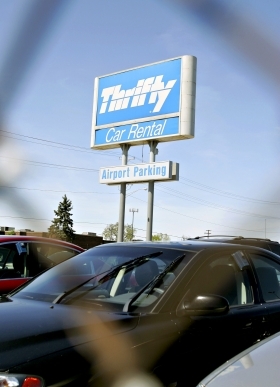 Dollar Thrifty has become the target of a takeover battle as bigger rivals expand into the highly lucrative leisure car rental market - which has remained healthy despite the recession because of stable demand from budget-minded consumers.